I saw this experiment here and it's one of the best science experiments I've done with the kids (and beautifully described too). Mr 5 in particular kept on telling me how cool it was. The gist of the instructions is to take an old plastic bottle and put a hole in the side, put a straw in the hole pointing upwards and seal the hole with blue-tac. Have a chat with the kids about gas/air and what's inside the bottle. Fill the bottle with water (until it's at risk of coming out the straw). 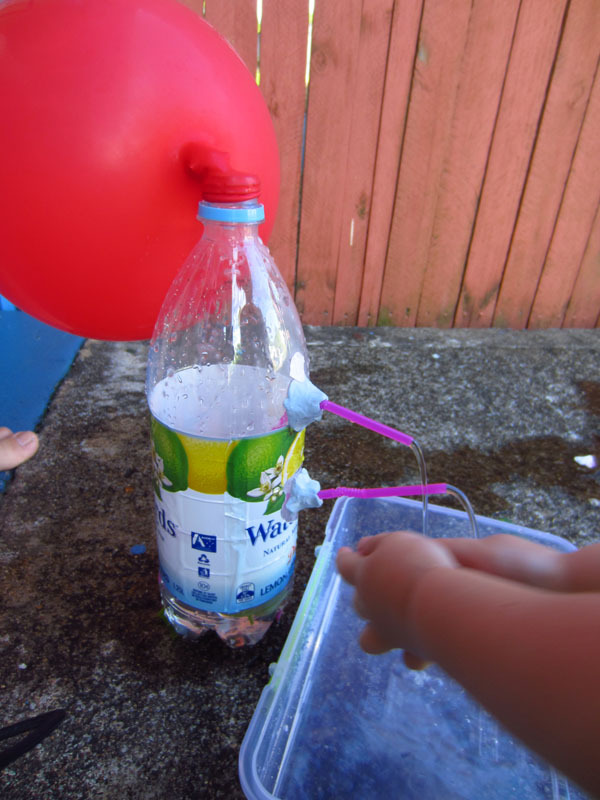 Blow up the balloon and talk about what's inside the balloon, and then put the balloon onto the bottle and watch the water squirt out. Not only did the kids seem to get the talk about air, they loved everything about the experiment. They filled the bottle up again and again and again. Then Miss 3 asked to put a second straw in, so we did that and talked about water pressure. And of course plenty of flower petals and leaves were added (because they were there, and to see what would happen - which wasn't a great deal). A perfect bit of summer science.